Screen shots of a Storymap utilizing base layers from National Geographic, simple annotations and layers of vector data from Sri Lankan sources. The bottom map utilizes the Stamen Water color tint and is layered with an urban areas layer sourced from IWMI ( see the links to actual story in the text). The GIS program at the Overseas School of Colombo continued to evolve and adapt to broader technological changes in the school and world in 2015. The most significant development has been the school’s move away from campus-based servers to cloud-based applications and online data. For the past seven years we have been running a small, but robust, GIS introduction program for students using desktop applications on computers in common spaces such as the library. Instruction has been based on using ESRI’s ArcMap desktop applications that are bundled with extensions as part of an annually renewed license. This represents a significant investment of the school in the software, provided locally by GIS Solutions Pvt. Ltd. I have also explored using QGIS and regularly utilize Google Earth, MyMaps and other freely available software. At the moment I am the only teacher providing the skills so it has been difficult to get all classes on board but I have been evangelizing colleagues to get them to weave GIS into their science and humanities units. In the 2015-16 school year students had to have their own laptops as a part of a 1:1 tech program and most of the desktop computers were phased out. One clear benefit of this is that all students can access ArcGIS Online regardless of their platform (ArcMap desktop was never available for Macs). Loading the desktop software on multiple machines is cumbersome and so the online options save time and hassle. Necessity being the mother of invention, I have been adjusting many of the DP Geography exercises that I had developed on ArcMap desktop to ArcGIS Online. Bandwidth and Internet speed is still an issue and for my own mapping and remote sensing work I prefer to use ArcGIS desktop. 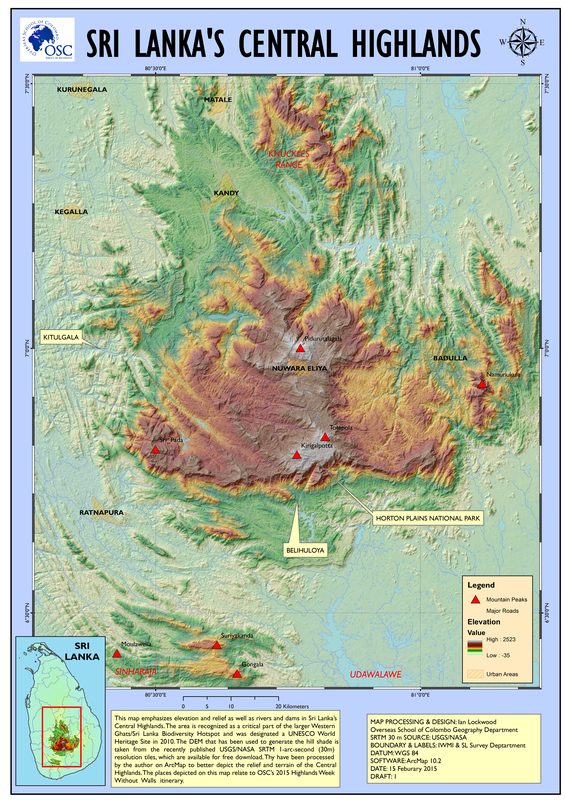 In the last two years I have refined my cartography with maps on Sri Lanka’s Central Highlands, the southern Western Ghats and Landsat imagery over the Pune Sahyadris. Screen shot of Maptia story on Kukkal (created by the author in 2014). This is not a spatial platform but Maptia offers a dynamic way to share digital stories that emphasize fine photography. One of the dynamic tools that has been introduced by ESRI alongside ArcGIS Online is StoryMaps. This online software allows users to create visual story lines that incorporate narratives, images, videos and maps. There are a variety of templates to set your Storymap up and you can utilize a treasure trove of online maps to illustrate your story. You can also load up your own spatial data and overlay this raster and vector data on the base maps to help tell a compelling story. Storymaps has excellent potential for teaching and learning and I have deployed it in the DP Geography classes to give students an alternative way to create case studies that are a key part of their course preparation ahead of the IB exams. To model this potential I have built a story around OSC’s Experiential Education program. StoryMap table of contents showing layers and projects. While story maps is ideal for sharing narratives that have spatial aspects there are other options for sharing visual narratives. Maptia is one free service that I have experimented with to tell a visual story. It offers impressive visual opportunities to share high quality images and a meaningful story. The numerous examples emphasize epic adventures and fine photography but could also serve as a vehicle for students to share learning from school trips and learning experiences. I used a story that I had written up about hiking in the Palanis for my first project entitled “Kukkal: Beyond the Last Ridge.” Maptia would be an ideal platform for students to share learning from experiential education – something I am trying to promote with colleagues at OSC. In the last decade huge advances have been made with making remotely sensed (RS) images of the earth available to the public. Google Earth helped popularize and introduce Geographic Information Systems (GIS) to the wider public as a free web-based application. While GIS software once had a reputation for being both expensive and cumbersome to use, developments in commercial software (ESRI’s ArcGIS platform) and freeware such as Q-GIS now make it accessible to anyone interested. The cost of remotely sense imagery is now within reach of organizations and much of this is in the public realm. At the same time growing concerns about changes on the planet associated with rapid economic development have provided a real need for better analytical tools. GIS and remote sensing helps us to better understand and address these changes. International Schools are beginning to use GIS in their secondary school curricula following on the heels of North American schools that have geography standards that incorporate GIS (see AAG links below). Given the rapid change in software and hardware options it can be a daunting program to add on to a school’s already packed curriculum. GIS and RS offer ideal opportunities for inquiry-based, interdisciplinary learning in international schools settings. The workshop will highlight examples from the IB Middle Years and Diploma Programs. A unique part of the presentation will share details on developments in South Asia and ways that the Indian Space Research Organization (ISRO) is sharing data through its Bhuvan platform. Fox, Lawrence. Essential Earth Imaging for GIS. Redlands, CA: ESRI Press: 2015. Print. Harder, Christian. The ArcGIS Book: 10 Big Ideas About Applying Geography to Your World. Redlands, CA: ESRI Press: 2015. Print & Web. Kimerling, A. Jon. et al. Map Use, Seventh Edition. Redlands, ESRI Press, 2011. Print. Review of book. Palmer, Anita et al. Mapping Our World Using GIS: Our World GIS Education. Redlands, ESRI Press, 2009. Print & Online Resources.